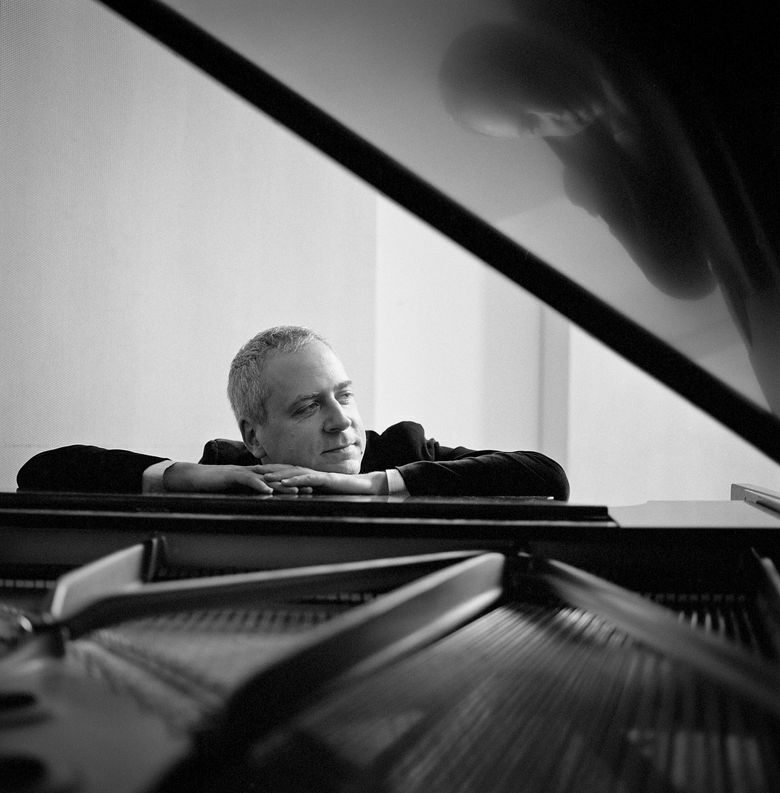 Pianist Jeremy Denk played a rhythm-oriented recital at UW that ranged from Bach to Art Tatum. Review of pianist Jeremy Denk, in recital at UW on Friday night, who delivered his usual — and admirable — blend of physicality, surprises and superb playing. When was the last time you heard “Graceful Ghost Rag” on a classical piano recital program? In his preconcert remarks, Denk called the program’s first half “a syncopated suite” and “an iPod shuffle,” both of which were accurate descriptions for a lineup that included takes on ragtime music by composers as disparate as Hindemith, Stravinsky, Ives, Joplin and Bolcom (his “Graceful Ghost Rag” was the loveliest of the set). These pieces were arrayed alongside Bach’s English Suite No. 3 (technically brilliant and remarkably varied), Byrd’s powerfully complex “Ninth Pavan and Galliard” (from “Lady Nevell’s Book”), the chaotically rhythmic Nancarrow “Canon,” and the overwrought Lambert “Pilgrim’s Chorus” (from Wagner’s “Tannhäuser”). There were many surprising moments; you don’t expect Byrd to sound so rambunctious, or the seldom-heard Nancarrow to sound like a pianistic popcorn popper. Nor did the audience expect the substitution of the planned second half of the program (a Haydn Fantasia, Beethoven’s “Moonlight” Sonata, and Schubert’s “Wanderer Fantasy”) with Bach’s “Goldberg Variations.” Few in the house were complaining, however, at the opportunity to hear Denk in the Goldbergs, a work he has performed and recorded to considerable acclaim over the past few years. Denk played the “Goldberg Variations” with an insouciant charm, and also with the sense that every note had been carefully considered: the attack, the separation or the fluid legato of each phrase, the nature of each articulation, the different character of each variation, the tricky crossing of hands, the variety in dynamics. Ornamentation was sparing but effective. He is an intensely physical pianist — the master of the head toss (accompanied by quivering jowls), his facial expressions showing joy or deep seriousness, or sly collusion with the audience. Denk’s control of the keyboard is remarkable. He is able to plumb the quietest dynamic ranges of the instrument without losing the sound or missing a note. By the end of the Goldbergs, Denk had established the sense of a mutual journey taken with his listeners, as the brief opening Aria finally returned in all its eloquent simplicity. The audience responded with a warm ovation and several curtain calls, but Denk wisely declined to play an encore: Bach had already given us the finale. Melinda Bargreen, who has reviewed music for The Seattle Times since 1977, is the author of two books, “Classical Seattle” and “50 Years of Seattle Opera”; she also reviews concerts for 98.1 Classical KING FM and The American Record Guide. She can be reached at mbargreen@gmail.com. This article has been updated since its original publication.